In 2004, there was one university in Rwanda — now there are seventeen. International university recruiters have begun to discover Rwanda, and this year we have launched an after-school study program for students who qualify for advanced tutoring. Our students’ lives go beyond books and studies… In 2017, we built a basketball court and we encourage a full range of sports and activities. The music program is also taking off with the guidance of teacher Danny Ruzaza and a recent purchase of new instruments. 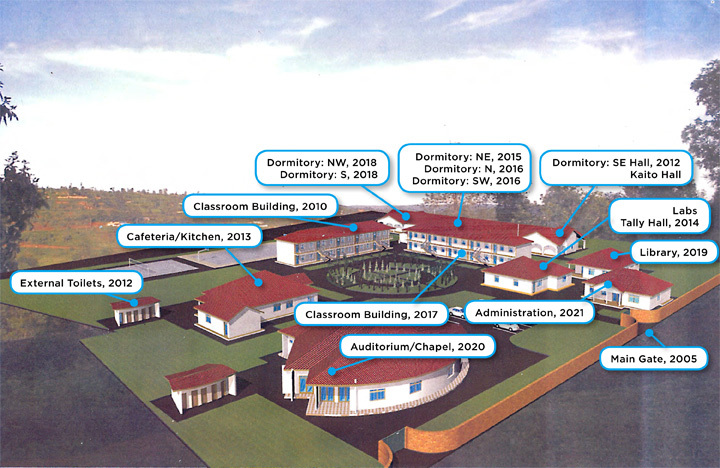 architectural drawing below shows the full vision of our campus.